It has been over 20 years since The Lost Dogs’ Home last played host to a Victorian Premier. It was the 90s and Premier Joan Kirner visited our North Melbourne shelter along with singer Neil Young and band ‘The Lost Dogs’, during the only media appearance of his Australian tour. Today we welcomed Victoria’s current Premier, Ted Baillieu, to the Home for a much more serious reason. After many years of campaigning from animal welfare organisations in Victoria – most notably the Oscar’s Law campaign organised by the dedicated Debra Tranter – the government has announced a crackdown on illegal puppy farms, introducing tough new penalties to all operators practising cruel breeding of dogs. 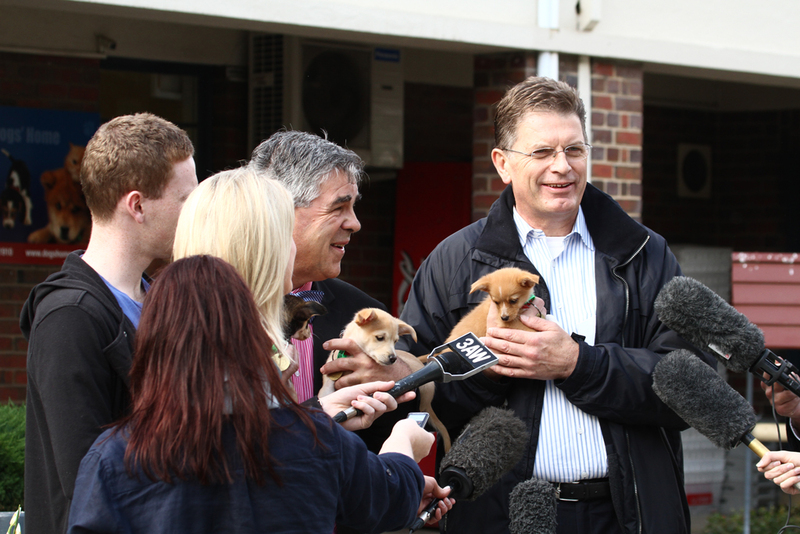 “Legislation being introduced to Parliament this week will deliver on our election commitment to crack down on illegal puppy farms and ensure operators are held accountable for the welfare of animals in their care,” Mr Baillieu said. The Premier – himself an owner to three Jack Russell Terriers – said the changes to legislation come as a result of witnessing the incomprehensible cruelty shown to dogs and puppies in illegal breeding operations. The new legislation includes a change to the definition of puppy farms; an increase in the maximum penalties for those operating illegally, of up to $20,000; penalties of $30,000 for rogue operators that breach the Code of Practice; and a ban on owning animals, of up to 10 years, to those found guilty of operating unregistered puppy farms or breaching the Code. There will also be new measures in place to assist the community in making ethical decisions regarding the purchase of puppies. “The legislation will also make it illegal to sell or advertise the sale of puppies without a microchip identification number or notice, giving the community confidence that puppies sold are only from legitimate breeders,” Mr Baillieu said. Managing Director of the Home, Dr Graeme Smith, said he was very pleased with the new reforms, which will hopefully see a decrease in the number of unwanted puppies and discarded former breeders in our care. The amendments to the Domestic Animals Act will be introduced to Parliament on Wednesday.